Spend a little time fishing in Virginia and you’ll soon discover some of the most diverse opportunities in the country. Between Chesapeake Bay, the Atlantic, and thousands of miles of Trout streams, anglers here have access to astonishing variety. There are few places where you can hook into Tuna one day and native Brook Trout the next—and this is one of them. Many visitors are surprised to learn just how rich these waters are, which makes VA one of the best kept secrets on the east coast. Freshwater lakes, ponds, rivers, and reservoirs host game fish like Bass, Crappie, Walleye, Muskellunge, Catfish, and various Trout species. 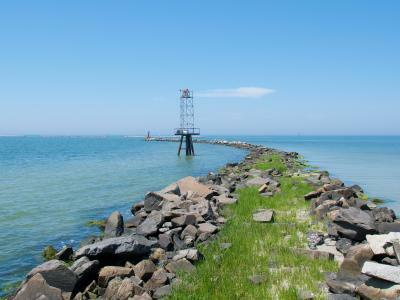 Meanwhile, Chesapeake Bay boasts Striped Bass, Flounder, Bluefish, Speckled Trout, and much more. Beyond the state’s eastern shore, a cast of iconic big game fish awaits. 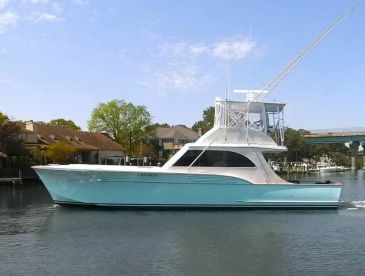 There’s no better way to discover everything these waters have in store than aboard one of many VA fishing charters. The only question is: Where to first? 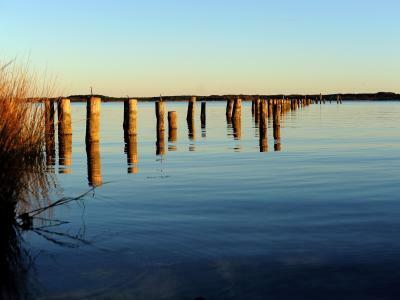 Whether you’re an avid angler or a history buff, it’s hard to overlook iconic Chesapeake Bay. Fishing opportunities here are largely decided by the season, so timing is everything. In spring and fall, anglers spend most of their time trolling for Bluefish and Striped Bass. By contrast, summer is all about bottom fishing for Flounder, Weakfish, Spot, and Croaker. 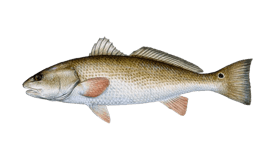 The bay’s western shoreline is riddled with smaller bays, creeks, and marshlands which host Speckled Trout, Bluefish, Weakfish, Flounder, Croaker, and more. This environment lends itself to a variety of techniques, and it’s common for adventurous anglers to wade into the shallows while casting flies, plugs, and jigs. 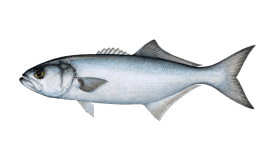 An even wider variety of fish becomes available toward the south end of the bay, including nearshore species that wander in from the Atlantic. The Chesapeake Bay Bridge Tunnel and several others act as artificial reefs, attracting Stripers, Bluefish, Cobia, Speckled Trout, Tautog, Flounder, Jack Crevalle, Houndfish, Spadefish, Mackerel, and more. 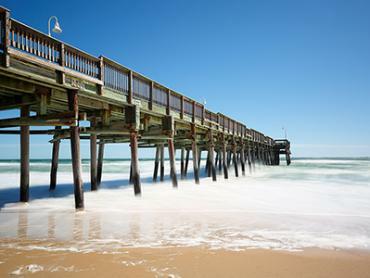 If you’re not satisfied by the selection in Chesapeake Bay, head to Virginia Beach. Charter boats here have access to the bay as well as the Atlantic, opening up another world possibilities to anglers. In spring and fall, offshore wrecks and reefs host Flounder, Black Seabass, Tautog, Triggerfish, and much more. Meanwhile, summer months are all about Virginia deep sea fishing, featuring epic battles with Marlin, Tuna, Mahi Mahi, Wahoo, and Sharks. Anglers fishing from Virginia’s eastern shore launch on both sides of the peninsula, bringing home catches from Chesapeake Bay and the Atlantic in a single day. In addition to year-round fishing opportunities in the bay and nearshore ocean waters, the eastern shore sees large Tarpon in summer, swimming in the channels and marshes between Virginia’s mainland and her barrier islands. Also known as Kerr Reservoir, Buggs Island Lake is the largest body of freshwater in the state. Covering 48,900 acres, it’s home to Largemouth Bass, Crappie, White Perch, and Striped Bass. Bass fishing is excellent in spring, when the water level is at its highest, flooding the trees and underbrush on the shoreline. Spring also yields big Crappie who like to school near submerged structure. If you’re in the market for VA’s biggest Striped Bass in freshwater, look no further than Smith Mountain Lake. The state freshwater record was established here in 1995 when anglers landed a fish weighing over 45 lbs, and people continue to catch 30-pounders every year. This is also an excellent place to get a taste of the Bass fishing Virginia has in store, including Largemouth, Smallmouth, and White Bass. Other common catches include Muskies, large Flathead Catfish, Crappie, and Walleye. Some of the most productive fishing spots in the state are small ponds, streams, and creeks. Whitetop Laurel Creek in the Mount Rogers National Recreation Area is one such place, where you can experience the stellar Trout fishing VA is known for. This stream is full of native Rainbow and Brown Trout, featuring Rainbows as big as 14” and some trophy sized Browns. Lake Moomaw in the George Washington National Forest hosts good numbers of Smallmouth and Largemouth Bass, with the largest fish ranging from 3-5 lbs. Lake Moomaw also has some of the best Crappie fishing in VA, with specimens weighing over a pound in spring. You can also catch Rainbow and Brown Trout here. 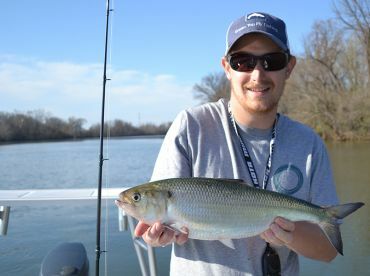 If you’re keen to try something different, try fishing the lower reaches of the James and Rappahannock Rivers. Deep water flowing past Richmond and Fredericksburg is home to especially large Catfish. Here, it’s not uncommon to land Channel Catfish weighing over 20 lbs and Blue Catfish close to 50 lbs. 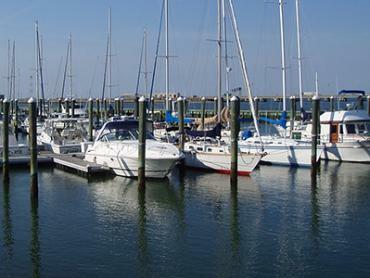 Most VA fishing charters include saltwater licenses for their customers. Anglers age 16 and older who do not plan to fish aboard a charter boat must buy a VA state saltwater fishing license and may need to register with the VMRC. Freshwater anglers age 12 and over must buy a VA state or county freshwater fishing license. Reciprocal MD state licenses for fresh and saltwater fishing are also valid in most parts of Virginia. Anglers fishing in the George Washington and Jefferson National Forests also need to buy a National Forest Stamp. A Trout license is required when fishing in designated stocked Trout waters. Many species are legal to keep year-round, but Trout are highly regulated and may not always be open to harvest. You can read more about Virginia fishing regulations online. Early in the year, some of the best fishing available is in Virginia’s lakes and rivers. Try your luck coaxing a bite from a variety of Trout, Bass, and more. February can be a good time to experience local Trout fishing, or try your luck with Yellow Perch swimming in the Northwest River. The shallow water bordering Chesapeake Bay holds Black Drum and more. Bass fishing picks up momentum in March, with Largemouths taking spoons, jigs, and other lures tossed their way. For best results, fish local lakes when the water is at its highest. 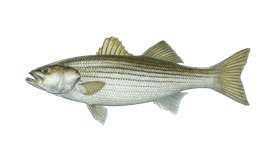 Come spring, anglers on Chesapeake Bay are trolling for Striped Bass (Rockfish) and Bluefish. Fishing on the eastern shore is just starting to heat up, with early Flounder appearing in the shallows. The Flounder run has begun, ringing in the season for bottom fishing. If you’re looking for some hard-fighting action, be sure to get in on the inshore Sharking fishing that kicks off this month. 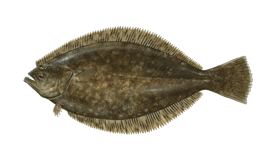 June is a great time to fish the offshore wrecks and reefs for Flounder, Tautog, and Croaker. 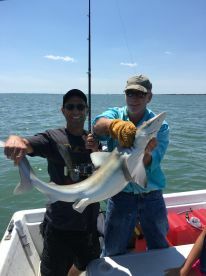 Shark fishing continues to please adrenaline junkies, who have their pick of inshore and offshore fishing grounds. 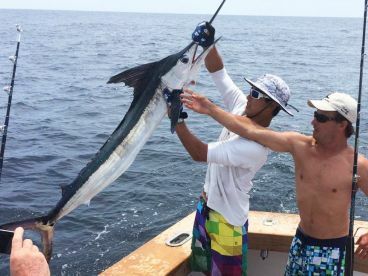 Bottom fishing continues to be the main attraction in Chesapeake Bay, while anglers on the eastern shore have their pick of Tarpon in the channels, a variety of fish on the wrecks, and big game prizes offshore. Summer is the season for deep sea delights like Tuna, Wahoo, Mahi Mahi, and monster Sharks. The offshore wrecks are abundant with Black Seabass, Spadefish, Triggerfish, Tautog, and more. Croaker start leaving in September, just in time for more Flounder to take over. Striped Bass and Bluefish are reappearing, and anglers on Chesapeake Bay will soon start trolling again. Yellowfin Tuna are swimming farther out, but you can still catch some if you’re up for a trip to the offshore fishing grounds. Meanwhile, anglers inshore are making the most of Striper season. Fishing close to shore is excellent at this time of year, with Stripers, Speckled Trout, large Black Drum, and much more to be had. Freshwater anglers can enjoy fishing for Trout and Bass. Many charter boats are closed for the season, but you can still have great success fishing from shore or casting your line in one of VA’s many lakes, streams, and ponds. 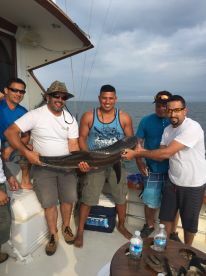 Head to the Potomac River for giant Blue Catfish. "4 hour fishing trip with Captain Jenkins"
"Full day trip with captain mike"